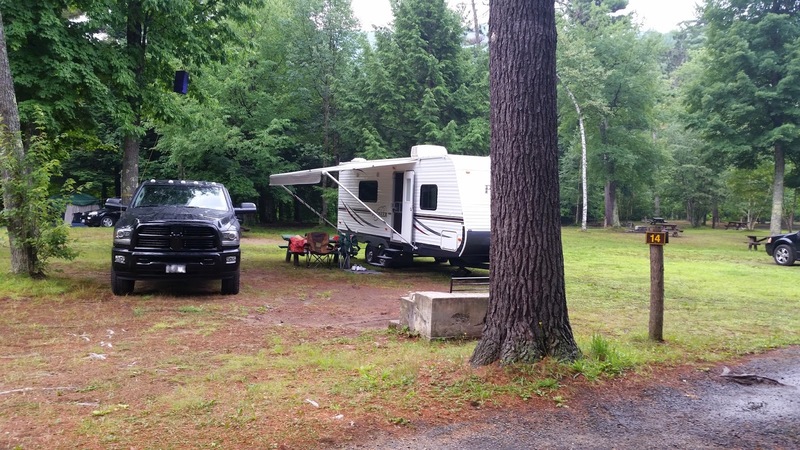 Our most recent campering adventure took us north to Wilmington Notch State Campground in Wilmington, NY. This is a very small campground (54 sites) and does not offer the types of private, treed sites we prefer. However, the choices for camping with a travel trailer in the Lake Placid area are fairly slim. We decided to try it once and then decide if we'd ever camp there again. The verdict: NO. The camp sites are in what basically amounts to an open field with an occasional tall tree. There is no privacy between sites AT ALL. The sites are not clearly defined either, so we had neighbors decide to set up their tent within spitting distance of our camper. I hope they enjoyed the sounds of our flushing toilet at 2AM. The fire pits are no more than a few feet from the campground road, so when you're sitting around the fire anyone that walks by is RIGHT there. Beyond the lack of privacy, there were other disappointments with the campground. The fire pits were in shambles, literally crumbling at our feet. My husband was at a complete loss without a chopping block, usually provided in most state campgrounds. He surmised that was part of the problem with the fire pits, because people were using them as chopping blocks, thus accelerating their demise. There was also garbage strewn around our site when we checked in, a rarity at the state campgrounds we've camped at in the past. And lastly, the bathrooms were gross. There was no soap (eeew!) and the showers were tiny. The shower head was well below the top of my head, and I'm not an excessively tall woman. The water was scalding, with no option to adjust the temperature. Needless to say, we spent as little time as possible at the campground. It would probably be fine if all you were doing was crashing for the night before or after climbing an Adirondack High Peak, but it's not the kind of place you want to spend time at. I didn't bother to take many photos and none of the ones I took actually show how undesirable the place was. All of the trees you see on the far side are actually the edge of the campground and provide just a little screening between Route 86 and the sites. This picture was taken before the neighbors arrived and set up their tent right off our back bumper. Most of the sites were occupied every night, although there was a high turn-over rate. Next time we travel to the Lake Placid region I would rather pay more to stay at a private campground and have full hook-ups. That way even though we'd still lack privacy we could at least avoid the public bathrooms and showers. Hopefully in future posts I will share some of the fun things we did away from camp. Sounds TRULY icky, thanks for the warning, I'll avoid the place!!! Sorry you had a bummer time at the campground, hope you had fun otherwise.